Surtsey volcano, Iceland, is a small oceanic island that grew from the sea floor during basaltic eruptions from 1963 to 1967. The island and its surroundings have been protected since birth as a pristine habitat for the study of earth and biological process. Surtsey became a UNESCO World Heritage Site in 2008. New drill cores will show how mineral and microbial changes have progressed in still hot basalt 50 years after the final eruption in 1967. 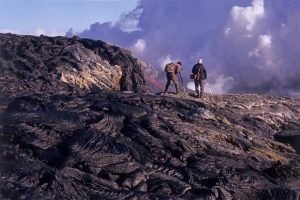 This blogspace hosts photographs and videos taken by the Surtsey team. Explore the menu bar to experience the progress of scientific research as if you were here! 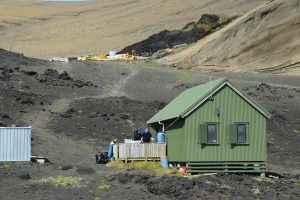 The Palsbaer Hut on Surtsey was the center of organization for the drilling operations, meals, and communal life. Drilling began on 24 July 2017 and ended on 10 September 2017. Check out the “DRILLING OPERATIONS ON SURTSEY” tab in the main menu to learn more. 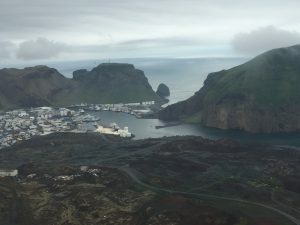 Heimaey, Vestmannaeyjar Island, was the site of the core processing operation of the new Surtsey drilling project. 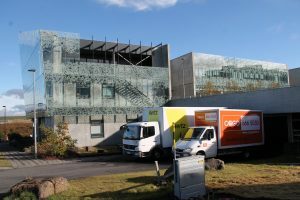 Core Processing began on 13 August 2017 and ended on 30 September 2017. Visit the tab “CORE PROCESSING OPERATION ON HEIMAEY” to explore what it takes to catalogue and preserve potentially fragile core for scientific research. Interaction with Media has been and continues to be a very important part of the new drilling project on Surtsey. Find documentaries, news reports, and articles in the “MEDIA” tab of the main menu. The above photograph was taken by Sigurdur Thorarinsson in 1963 and is the featured image in a Nature News article about the new drilling project. This news article can be found in the “MEDIA” tab. Looking for more? Check out Facebook and Twitter by clicking their respective icons at the top of the page. An in-depth look at the science and support involved in the project can be found at the following web-pages.